Elisabeth, Stein Roar and our dogs live in the countryside just outside a small town called Lundamo, 40 kilometres south of Trondheim city. We have the woods just outside our windows - which we know to appreciate. We use it everyday as our playground for hunting, practice or just taking the dogs for a run. Stein Roar is a building constructor. His first dog was a Schillerhound, which he used for hunting fox and hare. He now has a mix-breed (Coonhound/ Hamiltonhound), which has been his companion through ten years, hunting fox, hare and lynx. 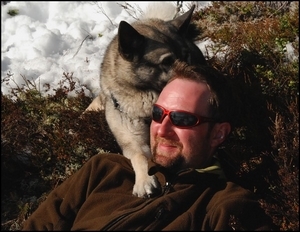 In the autumn, Stein Roar hunts for elk with our Norwegian Elkhound. Stein Roar is the one holding the greatest knowledge of practical hunting in our household. Elisabeth is educated animal nurse, but is now working as a nurse with humans. She got her huntingexam in 1999, and hunts various birds, fox, hare and occasionally also roedeer. She has written a major on "Animal Assisted Therapy In Human Cancercare" in 2011, is in the track- and huntingcommittee in the Norwegian Retriever Club, the obedience-committee in the local workingclub, and has taken numerous courses in hunting, obedience, utility, gametracking etc. She has passed the breeding programme of The Norwegian Kennel Club. Her first dog, which awoke her interest in dogs, was actually a Pomeranian, with whom she did agility. Chance made the second dog a Toller. We wanted a friendly and workable dog, and we certainly got that in Emil. He is a lovely dog, coming from a litter of four puppies, two boys and two girls, at the pretty anonymous "Søkkjelias Kennel". Emil is trained and has compeeted in almost every dogsport, and has done extremely well. He is a very trainable dog, with lots of drive and joy in his work. You can read more about him and his achievements in his personal page. Emil is the father of three litters - in Germany, Sweden and Denmark. We decided to keep a puppy, Lynx, from his second litter, at "Arbetsviljans Kennel". The main mission with her was to focus on hunting and tracking. The reason for narrowing down her range, was to make sure all our dogs got the time and training they deserve. Lynx, as well as her siblings, has developed just as we hoped both in health and workingskills. We therefore made the decision of having a litter with her in 2012. We wish to bring puppies to the world from a genuine interest in the toller breed, and not for profit causes. We emphasize breeding dogs who could add something positive to the breed in general. To be able to evaluate our breeding, it is essential to keep an open dialogue with our puppybyers. This means you will be bound to us throughout the puppy`s life. We want you to keep in touch with us, and will be happy to help you if any problems may occur, or if you have any questions. We do not sell puppies as pets only. We only breed healthy individuals of good appearance. When it comes to exteriour we do not cultivate dogs who are extreme in one way or the other. Medium angles, medium amount of fur, good bones and strong backs are qualities we appreciate, and believe are essential for a working dog. The dogs we choose to breed are free of diseases on hips and elbows, they are genetically tested for PRA (eye-disease known in Tollers) and found A (free) or B (carrier). The dogs are also checked for other known eye-diseases. We follow the ethical regulations of The Norwegian Kennel Club, and in addition we choose to keep a higher standard than the guidelines of the Norwegian Retrieverclub. We make a lot of effort finding the right combination of dogs. We are active people ourselves, and want the dogs to also keep up with this kind of lifestyle. We therefore wish for the offspring to have healthy built bodies, suitable for the activities and physical challenges of the retriever. We strive for the offspring to have a big amount of, but also manageable, workdrive. This we hope to accomplish by choosing what we think is the right combination of dogs, and giving the puppies reasonable amount of stress to manage during the puppyhood. We believe it is our duty as breeders to possess broad knowledge about the genetics, health and mentality in the breed. Every dog we choose to breed has known mental status, and reasonable reactions towards gunshots. It is essential that the dogs bred are friendly, tolerant towards other dogs, and have a steady mentality. 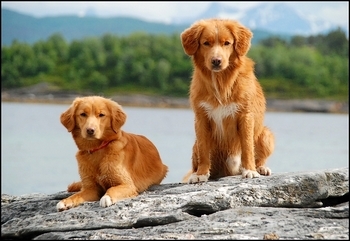 We believe that the Toller should be functional in social settings as well as having no problems working together with fellow retrievers in the fields. We primarily sell puppies to persons who intend to give the dog an active life, with physical and mental exercise on a regularly basis (hunting, tracking, obedience, agility etc.) We would also prefer you compeeting with the dog. How the dog handles the pressure in these settings, and how it succeeds, will help us evaluate our breedingprogramme. You do not need to have a lot of experience with dogs or dogtraining, but you must be committed and wanting to learn. We will happily help you to establish contact with people with lots of knowledge nearby you, if possible. To be a part of a traininggroup is important, both because of valuable feedback - and of course in a social matter! It is of great importance to us to obtain knowledge about the latest news in feeding, excersize and social stimulation in order to develop good physical and mental health in our puppies. The puppies will grow up inside our house, spending their hours awake together with us, getting to know everyday noises. They will meet children, adolescence and adults, travel by car, discover different environment etc. We will tell you if we have a puppy for you as soon as we are quite sure all of the puppies have survived the first couple of days, and are viable. We want you to succeed and be as satisfied as you can become with your new family member, and therefore we want to make the decision on which puppy goes to live with which owner, of course collaborating with you. We take under concideration what your intentions are with the dog, and what temper would suit this purpose. Which puppy goes where is decided around 7 weeks of age, when the puppytest and test of birdiness is done. * comes with a standard purchase agreement from the Norwegian Kennelclub. * are delivered registered in- and with papers from the Norwegian Kennelclub. * have each their healtcertificate of new date. * have had their vaccine against Parvo, are ID-chipped and treated against worms. * have done a puppytest around 7 weeks of age, and are tested for interest in game. * are familiar with game (birds, deer, hare) and whistlesignals. * gets a blanket with the scent of their mother and siblings, food, litterature ++ when leaving. * and their owners are expected to stay in lifelong commitment with us! We will arrange for several kennelgatherings, with topics such as tracking, retrieving and obedience, for our puppybyers. This gives you a nice opportunity to exchange experiences, and also to start/develop your dogtraining. It will also give us a perfect opportunity to stay in touch with you! We wish for the puppies to have a mental description done around the age of 14-24 months. You will receive an invitation from us to this event. This is not something you shall train your dog to manage. The purpose is for us as breeders to have an insight in how our breeding turns out mentally in the offspring. You will get useful information about your dog`s strengths and weaknesses. Information and invitations to the mental description and the kennelgatherings will be sent to you a couple of months in advance. We will greatly appreciate if you can find the time to participate in these arrangements together with the rest of the litter. * you take good care of your dog, and treat it like a member of your family. * you give your dog the physical and mental challenge it is in title of throughout it`s life. * you insure your dog, and make sure it is always adequately vaccinated. * you stay in contact with us, and let us know about the dog`s development and any problems that might occur. * you x-ray the dog`s hips and elbows around the age of 12-24 months (the females should not be x-rayed when they are in heat). * you show the dog at an official conformation at least ones after 24 months of age (we will do our best to help you with this, if you have no or little experience). If you achieve a champion-title for your dog in eather retrieving, obedience, agility or utility, nordic gametracking-championtitle or approved servicedog in the policeforce, customs or as a rescuedog, you will automatically have the rights for a free puppy from one of our future litters. If you think this sounds interesting, you are most welcome to get in touch with us! Write/tell us a little about yourself and what makes you wanting a puppy from us. What are your plans and intentions with your dog? We would very much like to meet with all our puppybyers before giving you a puppy, but we understand that long distance can make this hard to accomplish. Eather way - you are always welcome to visit us, the female and the puppies (after 3,5 weeks of age).